Conor had a business trip to Europe last week, so Liam & I flew to Spokane to finish up our shopping and get in some special Christmas activities with Nana & Pops! My mom's house is always so beautifully decorated each year; therefore, I will not miss an opportunity to enjoy it during the season. 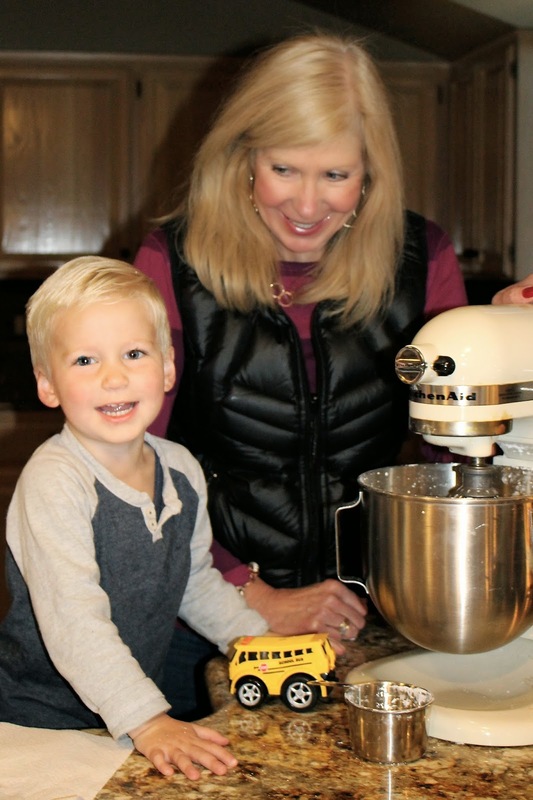 It was a busy week, filled with endless cups of eggnog, wrapping paper & bows, and the sweetest baking session with Nana! Baking & decorating sugar cookies was one of my absolute favorite Christmas traditions growing up. This was the first year that Liam got to experience it all, and it was extra special to be able to do it with my mom at her house. She pulled out her old wooden rolling pin that is missing half of the handle, and I'm pretty sure it has been around since before I was born! I had to cut him off from the dough, just in time for him to fall in love with the frosting even more. Eating the frosting that is; he wasn't overly enthusiastic about spreading it on the cookies. He would put the tiniest of dabs on a cookie and then proceed to shovel a few spoonfuls in his own mouth. Seemed to work great for him. While the art of icing wasn't his thing, he was all about the sprinkles & red hots! Red hots on all the cookies! So. Many. Red Hots. Good thing I'm a big fan of those. It was quite the afternoon! Same recipe from my childhood. Same cookie cutters that my little hands once pressed into the dough. Same kitchen. Same incredible memories. Flour was everywhere, fingers were sticky, & sprinkles were covering every imaginable surface. Holiday perfection! I hope you all have a wonderful Christmas and are busy making memories of your own. I'm stepping away from this little space for a few days while I celebrate with family! Merry Christmas! He looks like he had so much fun! Noah enjoyed the process too this year. This whole toddler thing really does just keep getting better! Merry Christmas! What a beautiful post and tradition. We made cookies growing up and I can't wait to share that tradition with my children. Liam looks so enthralled, it's so precious! I really do, and I always take that as a compliment! I hope I age as well as she has! Oh! This makes my heart happy. How special! One of my favorite traditions :) Merry Christmas, friend!! Have a wonderful holiday! Sprinkles, man. Aria agrees with the dough checking and frosting eating and sprinkle eating too. She had more of that then the final result. But, what is more fun that tasting along the way! So festive that you got to go home to do it too. Merry Christmas! Oh my gosh, this is so adorable! I just love it. Your mom must have been in heaven baking with him and he looks pretty happy himself! Gotta love that he likes to eat the frosting more than put it on the cookies. What can we say... kids love sugar!